Out of cash and desperate for a buyer, Jet is now operating just nine planes, according to the Press Trust of India, down from 123 at its peak. The company had grounded dozens of aircraft over the past few weeks as its finances deteriorated, and on Friday, it cancelled its last remaining international flights through at least Monday, upsetting the plans of travellers in locations from London to Hong Kong. The company’s 1,000-plus domestic pilots, who have not been paid for three months, have threatened to stop working Monday unless they receive their back wages. There is no money to pay them. Naresh Goyal, a former travel agent, founded Jet 26 years ago and built it into India’s largest carrier by offering travellers a modern, efficient alternative to the poor service and unreliable schedules of India’s government-owned carriers. But as a new crop of discount airlines emerged, Goyal failed to adapt and instead borrowed heavily in an attempt to maintain Jet as a high-end carrier. 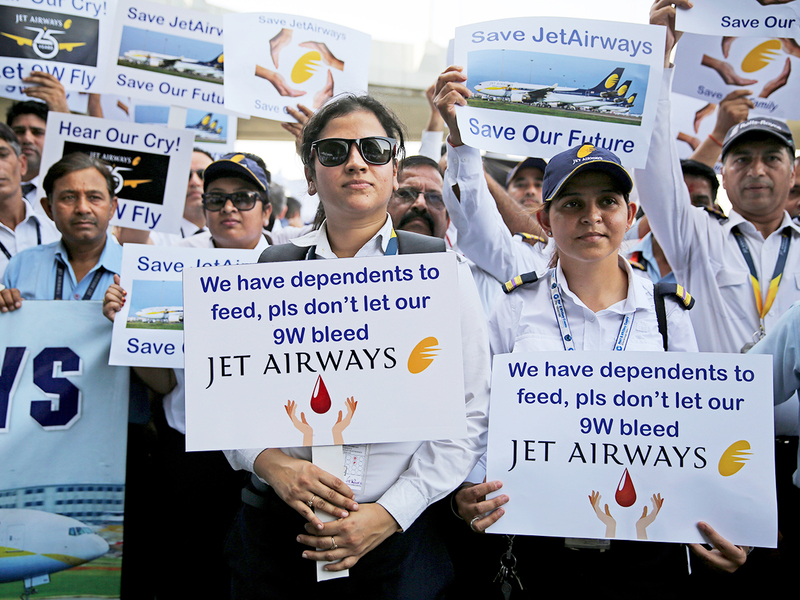 Goyal was forced out last month, and Jet is now controlled by its lenders, which are collectively owed about $1 billion. Led by the government-owned State Bank of India, they are trying to sell 75 per cent of the company by the end of the month. Jet’s major competitors have expressed little interest, and the banks have refused to provide a promised $217 million in interim funding. Aviation authorities have been giving away Jet’s prime airport gates and flight slots to other airlines to increase capacity and ease fares that have shot up with the elimination of so many seats. And the companies that own Jet’s aeroplanes have been repossessing them after the company defaulted on lease payments. Passengers have also been burnt as Jet has cancelled flights on short notice. On Wednesday, a flight from Amsterdam to Mumbai was cancelled just before boarding after Jet’s local cargo handler seized the Boeing 777 for non-payment of debts. The airline’s best hope might be a bid from Etihad Airways, a carrier based in Abu Dhabi that owns 24 per cent of Jet. Etihad is wrestling with its own financial problems, but it does have deep pockets: It is owned by the oil-rich Abu Dhabi government. Jet’s other major airline partners — Delta Air Lines, Air France and KLM — have so far shown no inclination to join the fray. Any buyer will find it difficult to make money. Indian travellers are very price conscious, and efficient low-cost carriers like IndiGo and SpiceJet will make it difficult for Jet to charge a premium for its full-service offerings.